Heating, ventilation and air conditioning technicians are the stewards of human comfort in the modern age. Responsible for the installation and maintenance of heating and cooling systems in residences and corporations, HVAC technology is becoming an increasingly popular profession. During HVAC training students can expect to learn everything they’ll need to know in order to secure a job and excel in the field. Read on to learn more about how to become an HVAC professional. Dan Fleischer has always been the entrepreneurial type. After retiring from working the graveyard shift at the Stardust Hotel and Casino, he decided to go into business for himself. He started Dan’s Heating and Cooling Inc. in 2005. He has been servicing the greater Las Vegas area since, and has no plans of stopping any time soon. With the constant demand for temperature control in both residential and commercial spaces, HVAC professionals are always needed. In order to successfully pursue an education in this field, one should be aware of the best HVAC training programs available to them. 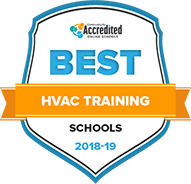 We weighed all of the schools that offer HVAC training curricula and have found the top programs in the country based on variables such as cost, financial aid, graduation rate and student-to-teacher ratios. View the top HVAC training programs for 2018-2019 below. Altierus Career College's HVAC technician program can be complete in just 9 months. Through hands-on training, students will learn how to read blueprints and designs for proper installation and repair of HVAC systems, install electrical wiring and controls, and improve efficiency. After completing the program, graduates are prepared to take the professional certification exam to further boost their employment and salary potentials. This certificate program is offered at the Tampa, FL and Houston Bissonnet campuses. Those looking to enter the job market quickly as an HVAC technician can receive the proper training through Cabell County Career Technology Center. The HVAC technician program gives students the knowledge and technical skills needed for a successful HVAC career. A range of foundational topics are covered, such as basic electrical systems, tubing and piping, duct systems and fundamentals of AC/refrigeration. Cabell also offers an HVAC Technician Advanced program for those who have already completed HVAC training and certification. This program gives students the opportunity to earn NCCER certification. If you're interested in a career as an HVAC technician, the University of Cincinnati offers 4 online training programs that can help you achieve that goal: HVACR certified technician, HVACR controls/building automation systems and HVACR technician - NATE service core (Spanish or English). All options can be completed in 6-12 months, with the HVACR certified technician program being the longest at 12 months. This all-inclusive training program covers the skills and knowledge you'll need to work in the field and tuition includes the cost of exam vouchers for the most current industry certifications. Northern Michigan University, which is accredited by the Higher Learning Commission, trains students to install and repair heating, ventilation, refrigeration, ducting and A/C in an array of settings, including grocery stores, hospitals and shopping malls. The school's 2-year certificate requires the completion of 44 credits with a minimum 2.0 GPA. There is no GPA requirement, however, for admission. Students can take advantage of the Academic and Career Advisement Center to receive tutoring, career assistance and writing help. For students who have completed an associate degree in HVACR technology, Ferris State University is 1 of 2 nationwide institutions to offer a 2-year completion program for earning a Bachelor of Science in HVACR Engineering Technology and Energy Management. All coursework, which is accredited by the Higher Learning Commission, is available in a fully online format through the web platform Blackboard Learn. Students can access an online writing center, tutoring and academic advising to assist in their studies. Applicants must have a 2.5 GPA to be admitted and then must maintain a 2.0 GPA for the 124 credits needed to graduate. Following 2 semesters and 35 credit hours, students at Pickens Technical College can complete a certificate in heating and air conditioning service technology. The program also leads to EPA and OSHA certification as well as prepares students for the Industry Competency Exams. Coursework, which is accredited by the Council on Occupational Education, uses computer simulations and live equipment to train students. In addition, students are provided with internship opportunities at Aurora Public Schools Maintenance Department. Students must uphold a "C" or better to complete all classes. Students can select from 3 routes to become trained in air conditioning and refrigeration technology at Trenholm State Community College. Students can complete 71 credit hours to earn an Associate in Applied Science degree for A/C & Refrigeration Technology, 63 hours to finish the same degree with a focus on refrigeration only or 28 hours for a short-term certificate in basic A/C and refrigeration concentration. The majority of program-specific classes are available in an online format. All coursework is accredited by the Southern Association of Colleges and Schools Commission on Colleges. For those interested in pursuing employment as a heating and air conditioning technician or refrigeration mechanic, a certificate in Heating, Ventilation, Air Conditioning & Refrigeration from Orange Coast College can be earned. Accredited by the Western Association of Schools and Colleges, the 30-hour program prepares students to take the EPA Certification test for refrigerants or the NATE Certification test for HVACR. A 2.0 minimum GPA is necessary for admission as well as to complete the certificate. At Lurleen B. Wallace Community College, prospective students looking to pursue a career as an HVAC technician can get the training they need through the college's Career/Technical Division. The 60 credit Air Conditioning and Refrigeration program is hands-on and students will learn basic theory and fundamentals of domestic and commercial refrigeration as well as residential and commercial air conditioning. The program focuses primarily on technical skills through courses such as principles of refrigeration, heat pump systems I and II, and special topics but does include a handful of general education courses such as English composition, mathematical applications and fundamentals of oral communication. At SUNY Canton, students interested in the Air Conditioning Maintenance and Repair certificate program will gain the knowledge and hands-on experience needed for a successful career as an HVAC technician. Through small laboratory sections and one-on-one instruction, students will take courses such as refrigeration and air conditioning service, blueprint reading and drafting, and system design, to name a few examples. Graduates of this certificate program have found employment in refrigeration and air conditioning supply houses, hardware stores and as contractors. For those looking for additional training and education, this program can be transferred to an AAS degree or another certificate program at SUNY Canton or other SUNY Technology Colleges. HVAC training takes on a few different forms. It can be achieved through a technical school, community college or apprenticeship program, all of which have attributes that make them valuable options for different types of students. Regardless of the program type, HVAC training focuses on teaching students how to effectively install and maintain heating, cooling and ventilation systems. Technicians should not only gain a deep understanding of the mechanics involved, but the design, troubleshooting and physical requirements of the job as well. Job opportunities for graduates include careers as HVAC technicians, designers, manufacturers or owner of an HVAC company. Dr. John Gorrie of Florida is considered to be one of the fathers of air conditioning and refrigeration when he advocated for suspending ice from the ceilings of patients’ rooms to make the room more comfortable. After inventor Willis Carrier created an air conditioning unit designed for movie theaters, Americans of every class were able to enjoy the comfort provided by the machine. It’s becoming increasingly popular for new homes to be retrofitted with more efficient energy systems such as a geothermal unit and energy management and storage systems that can reduce energy usage even in peak summer hours. HVAC technicians that are familiar with computer systems and trouble-shooting tend to have a higher percentage of employment as many companies have a difficult time finding and retaining technicians to work with the increasingly complex systems. There are three major options when it comes to receiving HVAC training. The different options allow students with different schedules, budgets, and learning and personal needs to choose what works best for them. Below is a detailed breakdown of programs offered through career and technical schools, community colleges and apprenticeship programs. The key goal for career and technical school HVAC programs is to ensure that students build the necessary skills to succeed in the field, in addition to the knowledge to pass certifications such as the EPA 608 exam. Core subjects include legislation regarding Freon recovery, air conditioning (cooling), air conditioning (heating) and trouble-shooting. This often includes field experience with local air conditioning and heating companies. Typically career and technical schools require about 250 to 300 credit hours. For students who may not be able to maintain a traditional schedule, there are class options for day as well as night classes. Below is a list of common courses HVAC professionals need to take in order to have a finite understanding of how to operate, repair and install heating and cooling systems in addition to understanding the laws and legislation that impact installation and disposal. Basic Electricity An entry-level course designed to familiarize students with HVAC electrical terminology, component identification and basic equipment functions. Fundamental HVAC Maintenance This course presents the methods of evacuating, recharging, recovering and disposing of refrigerants, types of tubing and piping in HVAC systems, and proper methods of configuring and connecting pipes or tubing. Domestic Appliances and Cold Water AC This course is an introduction to residential refrigeration, freezers, and portable air conditioning units. Coursework addresses operation, maintenance and troubleshooting of chilled water air conditioning systems. DET Training This two-day course is designed to introduce the skills necessary to become a Duct and Envelope Tightness (DET) Verifier. Receiving HVAC training at a community college is for students who have already received a high school diploma or GED equivalent. Community colleges, much like their technical school counterpart, ensure that their graduates are highly qualified to work in a variety of different heating systems, heat load calculation and system design, air duct fabrication and calculation and much more. However, it is important to take your educational goals into account when looking into community college HVAC programs because different schools offer varying program options. The most common is an Associate of Occupational Studies Degree, but they may also provide a technician certificate as an alternative. Read on to see a sampling of community college course options that cover everything from basic heating systems, to more tailored classes aimed at specific methods of heating and cooling. Gas Heating Systems This course will teach why natural gas is such an efficient fuel and the inner-workings of gas-fueled furnace systems. HVAC Diagnostics In this course, you'll learn how to troubleshoot different HVAC systems. You'll learn the chokepoints where systems most commonly fail, and how to bring fix a system under adverse conditions. System Controls This course teaches students about the range from simple thermostats to complex, computer-controlled systems that manage microclimates within giant structures. Building Mechanical Codes This course helps develop a working knowledge of mechanical, fuel, gas, plumbing and electrical codes for HVAC applications. Apprenticeship programs are offered by both trade unions and privately owned businesses. Apprentices must complete approximately 8,000-10,000 hours of training, and in some cases are also required to attend related instruction courses. During this time apprentices learn the ins-and-outs of the HVAC trade. They are often paid for their labor at an apprentice rate and work their way up to a journeyman’s rate throughout the course of the program. Apprenticeships are limited to those who are 18 years of age and older, have a high school diploma or GED equivalent, perform the physical tasks required of HVAC technicians and pass an entry examination. Many apprenticeship programs incorporate classroom elements into the HVAC training, but the following list highlights essential skills learned during an apprenticeship that might not take place in the classroom. Safety During an apprenticeship program, students will learn how to practice safe work practices that are in compliance with state and federal law. Installation and Service of Equipment Apprentices will also learn how to install and service furnaces, boilers, heat pumps, air conditioning and indoor air quality equipment. (Sheet metal – Airflow) Another essential skill gained is how to set grills and registers, supply and return duct systems, exhaust fan ducts and airflow testing. Tools Knowledge Apprenticeship students will also learn how to handle power drills, benders, snips, saws, hand tools, torches and sheet metal fabricating machines. Accreditation ensures that a program’s curriculum is held to national standards. Employers look for graduates of such programs as they demonstrate that the technician went through a rigorous training, and is well versed in the trade. Non-accredited programs can be a waste of resources, as they don’t hold the same educational value. Programmatic accreditation is offered by organizations such as HVAC Excellence and Building Performance Institute, Inc. Since there are some certificates and licensure that are required before an HVAC technician can legally work in a state, prospective students should research the preparatory courses offered by a program, and compare the curriculum with required state licenses. Different institutions require varying minimum hour requirements. This can affect everything from tuition to scheduling, so it’s important that you’re realistic about the time you can commit when researching programs. Some programs require an entrance or competency exam in order to enroll. These can have deadlines, testing locations and take time for results. If the program does have an entrance exam, be sure to keep track of the deadlines and costs as they have the potential to throw enrollment off course. In addition to entrance exams most programs have age, experience or high school education requirements. Ensure that you meet all the pre-requisites before applying to a program. Technical schools and community colleges come with a price tag. Make sure that the program you choose is affordable. With the options to receive an HVAC training from either a community college/technical school or through an apprenticeship program, making a decision as to what’s best for you can be overwhelming. However, there are some key benefits unique to each program that can make it easier to choose between the two. Often provides a direct path and preparation to the required certifications and licensing. Flexible scheduling with day or night programs available. Ideal for those who prefer to learn within a classroom environment. Apprentices earn a wage, though reduced, from day one. Programs also offer dental, health and other benefits to apprentices. As apprenticeships involve on-the-job training, it is ideal for people who are tactile learners. With the increasingly complex nature of heating and cooling systems, the career opportunities for professionals in the field are growing. Those with valuable HVAC training and certification have a positive job outlook with 14 percent industry growth projected from 2014 to 2024 (higher than the national average) according to the U.S. Bureau of Labor Statistics. Generally speaking, most HVAC technicians work in homes, schools, office buildings, hospitals and factories. Competency in computers and electronics is encouraged to get ahead in the field. As technicians progress through their career, it is not uncommon for HVAC technicians to specialize in instillation, maintenance or repair. Due to the toxic and volatile nature of the materials and systems that HVAC technicians work with, there are some certifications that are either required or strongly encouraged for professionals to enter the field. Some are specific to states or federal law in the handling and disposal of dangerous materials, while others focus on honing skills that will make the holder a more competent and qualified professional. The U.S. Environmental Protection Agency requires that all individuals who handle refrigerants be certified. This not only allows the holder to legally buy refrigerants, but it also gives the necessary credential needed to service any building air conditioning and refrigeration systems. There are three specializations for this exam: small appliances, high-pressure refrigerants and low-pressure refrigerants. Any technicians applying for this certification must choose one. Refer to the EPA’s website on A/C and refrigeration technician certification for details. More information about certified providers of the exam can be found here. Provided by North American Technician Excellence, the ICE certification is a leader in measuring basic competency in the HVAC industry. This certification is geared toward HVAC professionals who have one year or less of experience. It measures baseline competency in residential, light commercial A/C and heating and commercial refrigeration. It is available to take both online and in-person. The nonprofit organization HVAC Excellence offers a variety of optional certifications for different skill levels. The professional level certifications are for those with at least two years verified field experience and a passing grade on the core exam. It is only awarded to technicians that can pass both the prerequisite and closed book exams. These exams will test competency in a variety of areas that include, but not limited to heat pump service, gas heat, combustion analysis and light commercial refrigeration. For more information, visit the HVAC Excellence page on professional level certifications. The first step in diagnosing the problem with an air conditioning unit is having the ability to read gauges, dials or other indicators to see whether or not something isn’t right with a heating or cooling system. Knowing how to monitor these indicators is integral to performing the duties of an HVAC technician. Though many may not associate the design of technical blueprints with HVAC technicians, knowledge of the subject is vital to their trade. It allows technicians to gain a deeper understanding of the machines they’re working on. Understanding the quality of your work is essential to creating the high standard that will nurture client relationships, and benefit your reputation as a reliable HVAC technician. A technician that demonstrates their knowledge and competency in a clear, measureable manner will impress current and future clients. Not every solution to an air conditioning or heating problem has a textbook answer. Because of this it’s important for HVAC technicians to have both inductive and deductive reasoning skills. Customer relationships are built on good communication. Being able to effectively communicate issues and solutions are vital to nurturing the positive relationships that will encourage future business. Working as an HVAC technician requires being in tight quarters that can be outside, or in uncomfortable indoor settings as the AC or heater is broken. Having the physical capability to complete these tasks is incredibly important to becoming a successful technician. Dan Fleischer, owner of Dan’s Heating and Cooling Inc. I received my education at the EC Goodwin Technical School in New Britain, Connecticut. What expectations of the field did you have as a student? How did that change after entering the field? My life changed when I was able to do work as journeyman status in the field, and I was able to do hands-on work and earn a respectable living. They took me from the ground floor up to working status, [and] I’ve never been unemployed since the day I left school in 1977. My family has benefitted immensely with private school, music lessons and no students loans for college. Coming from a small town, you can’t ask for much better than that. What was the best piece of advice anyone has ever given you regarding the HVAC profession? The best advice that I received from our previous generations (or mentors) that was involved in the air conditioning field is that the minute you put your name on the side of your truck, you are now taking responsibility for their comfort and health.